The physical book that started it all is now available as an Audio Book! 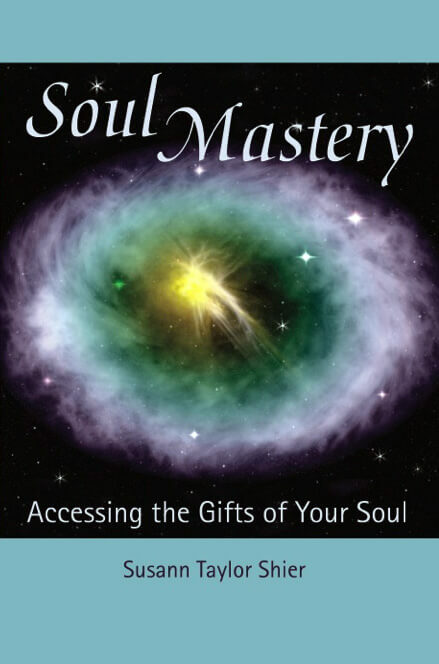 Go to Soul Mastery MP3 Audio Book to learn more, or you may purchase this popular MP3 version at the bottom of this page. I wrote this book because of the encouragement I received from numerous clients and students that I was assisting to live more potently and clearly from their Soul gifts and strengths. It is vital to connect directly with all that the wealth of our spiritual dimension has to offer to our physical expression of life. Through the doorway of the Akashic Records you will discover your Soul’s strengths, gifts and purposes. Open to all that your Soul wishes you to receive of your destiny for this lifetime of exploration. This is a time of magical re-uniting with your Soul essence, wealth and wisdom. We are each a master, here to bring our Soul’s purpose, our heart’s fulfillment, and our life mission. As a master, it’s our job to understand why our Soul chose to come to Earth, how it is to bring Light into a world at a time when great darkness prevails. Each Soul has many helper aspects it is connected to: guides, angels, councils of beings, and Soul families. Through our Souls, we belong to a collective, unified energy field that is working for all humankind, more than ever at this highly significant time in our universal history. Each moment that we ignite our life from our heart and Soul, we are aligned with our Soul’s destiny and we are practicing Soul Mastery. As simple as it sounds, accessing the gifts of our Soul is the greatest offering we each can make to return the world to its original Blueprint based on love. By connecting you to your Soul’s heritage, this book will help you open the doors to your Soul’s personal mission and give expression to that mission in your daily life, bolstered by the divinity of your heart. You are not alone. Many Souls like you have volunteered to come here with treasures of Spirit to assist this world to return to a Blueprint fueled by Divine Love. In fact, Souls have been dedicated to coming here for up to 250,000 years from planets that are part of other star systems. These Souls have spent their existences there developing qualities of spirit that make up the Soul heritage you experience in your daily life. In these worlds where our Souls came from, we were known by our true families. We have given this memory of belonging, brought to us from those worlds to our consciousness here. It is my hope that the divine outpouring within the pages of this book will reawaken all that you are as a Soul: that divine part of you that so generously came from other reaches of this grand galaxy. I thank you from all that I am for taking the journey to come here and spread the seeds of your Soul’s wealth to help bring back the original Blueprint, fueled by Divine Love. If you’re moved by what Soul Mastery: Access the Gifts of Your Soul brings to you, be sure to check out these complimentary books of the trilogy! : Soul Radiance: Bring Your Soul Riches to Life and Soul Reunion: The Return Home from Separation. Access the Gifts of Your Soul. Softcover. 272 pages. Access the Gifts of Your Soul. PDF, 296 pages (instant download).